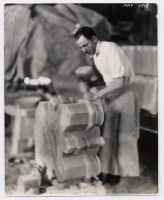 Description: Stone carver using a mallet and chisel on a column base. "Felix [sic] Sabatino" written on label. Felice Sabatino (1891-1972) worked as a stone carver and chief modeler for the Cathedral project.